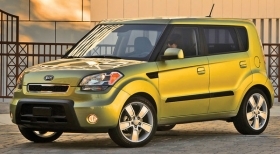 Sales of the new Kia Soul helped boost Hyundai-Kia group's market share by 2 percentage points in 2009. What's the upshot of a full year of disastrous sales results when it comes to the industry's rankings? Some surprising winners and losers and an unexpected failure by Japan's Big 3 to take advantage of collapsing market share at General Motors and Chrysler Group. November's flat sales suggest a bottoming out of the industry, but the dust has hardly settled. And with the industry still in turmoil, "all this market share is up for grabs," says analyst George Magliano of IHS Global Insight in New York. The rankings are being reshuffled as sales have plunged 24 percent this year. Ford brand will outsell Chevrolet this year for the first time since 2006, and American Honda will replace Chrysler Group as No. 4 in U.S. sales -- milestones that would have brought waves of attention a few years ago. Subaru has moved up eight places in the brand rankings and now sits just outside the top 10. The bankruptcy twins, GM and Chrysler Group, lost a combined 4.4 points of market share in the first 11 months this year. Four companies have captured virtually all of what GM and Chrysler lost though, surprisingly, Toyota Motor Sales U.S.A. is not one of them. Hyundai-Kia grabbed almost half the pie with a gain of 2.1 points through the first 11 months. Ford Motor Co., Subaru and Volkswagen-Audi split nearly all the rest. That left just crumbs for the three Japanese automakers that for years have dominated the shift in consumers' auto-buying loyalty to nondomestic brands. American Honda and Nissan North America each gained 0.2 points, but Toyota Motor Sales U.S.A.'s 2009 market share is unchanged at 16.8 percent. Hyundai-Kia is the big winner, with sales rising 7 percent through November and market share up by 2 points to 7.2 percent. Chrysler Group lost 2 points, going to a 9 percent share on a 38 percent sales nose-dive. November sales illustrate the separation of Chrysler Group and Hyundai-Kia from the pack -- in opposite directions. American Honda, GM, Ford Motor and Toyota Motor Sales all clustered within 3 percentage points of the flat industry total for the month. But Chrysler Group sales fell 25 percent to 63,560 units while Hyundai-Kia's sales soared 34 percent to 46,002. Analyst Magliano sees most of the recent shifts as long-term changes. But plenty is still up in the air. "Generation Y will become much bigger by 2015, and none of these guys have captured this younger generation," he says. GM Chairman Ed Whitacre has said he wants GM to boost market share back above 20 percent, but Magliano forecasts a continuing GM decline from the current 19.8 percent before stabilizing near 16.8 percent in 2012. "I don't think GM can convert all these Pontiac and Saturn owners into customers," he says. Magliano expects most of this year's share swings to continue, with Ford, Subaru and VW growing, Hyundai-Kia stabilizing, and GM and Chrysler continuing downward. Magliano says several factors have contributed to Hyundai-Kia's surge: a string of new products; increased incentive spending; a favorable currency exchange; aggressive and innovative marketing, a budding reputation for high quality and the opening of two new U.S. assembly plants. Both Korean brands are also increasing fleet sales, Magliano says. November's sales were down 37 percent from November 2007. But it's the second-straight month that sales have been flat compared with the year before. Though still cautious, automakers are sounding more optimistic. "Sales are starting to stabilize and the worst is behind us," says Ford sales boss Ken Czubay. "Our total sales and our retail sales were higher even though our incentive spending is lower." Sales in 2009 will finish at about 10.3 million, but Toyota brand chief Bob Carter forecasts that 2010 industry sales will be "in the middle 11 million range" and says Toyota is aiming to boost dealer inventories to 225,000 by year end to meet anticipated demand. That's up from 188,000 on Dec. 1, he says. "The economy is beginning to improve, led by gains in consumer income, consumer spending and consumer confidence," Carter says. But both Ford and Toyota executives pledge to keep vehicle inventories lean to avoid having to boost incentive spending to move excess stock. "We'll let the product do the talking," Czubay says. Manufacturers bumped overall incentives $32 to $2,713 per vehicle in November from year-ago levels, according to Edmunds.com. But strategies varied, with most manufacturers trending downward. GM and Honda were the only major automakers to boost incentives last month. But while Honda rose 7 percent to $1,195 per vehicle, GM incentives jumped 27 percent to $4,270, making it the per-vehicle spending leader among major players.